At someone’s suggestion — brilliant, I thought — I decided to get Beanie Babies for the kids’ gift bags. They’re “vintage” now, yet plentifully available. You can get them on ebay for about a buck apiece. So I ordered a mixed lot of 20. I have 16 kids coming. Plenty of room for error. They look good, but thank God I ordered extra. First, one of them had a small hole in his leg, out of which wee white beads trickle every time I move him. I could sew it up, but who am I kidding? I won’t. So he’s out. Then there are three — yes three! — owls wearing graduation hats. They’re cute — ish — but they say “Class of ’98” on them. Talk about dating yourself. That may seem quaint or collectible to someone in their thirties, but to a three-year-old it’ll just be weird. And alienating. If three-year-olds can be alienated. I know their parents can. So ixnay with the owlsnay. The remaining sixteen dolls are cute — mostly assorted dogs and birds. I have to say, though, they smell musty. The way your fingers do after you go through the racks at a Salvation Army. They’re new with tags, and many of them are still wrapped in plastic, but nevertheless they’ve been stored in someone’s garage for, well, at least 13 years now. Their odor reflects this. I have decided to kill two birds — Beanie, of course — with one stone. I have placed the dolls in their individual party sacs to allow them to air out some in the next day or two. But I have also placed….wait for it…a clementine in each bag. What an old-fashioned, harmless, tasty, and — yes — aromatic addition! And hypoallergenic! I think. Anyway. Hopefully in two days the dolls will smell more of citrus and less of a thrift store. As for the three owls? Perhaps I’ll stick them in my garage and get back to them in another fifty years. They could be worth a fortune. 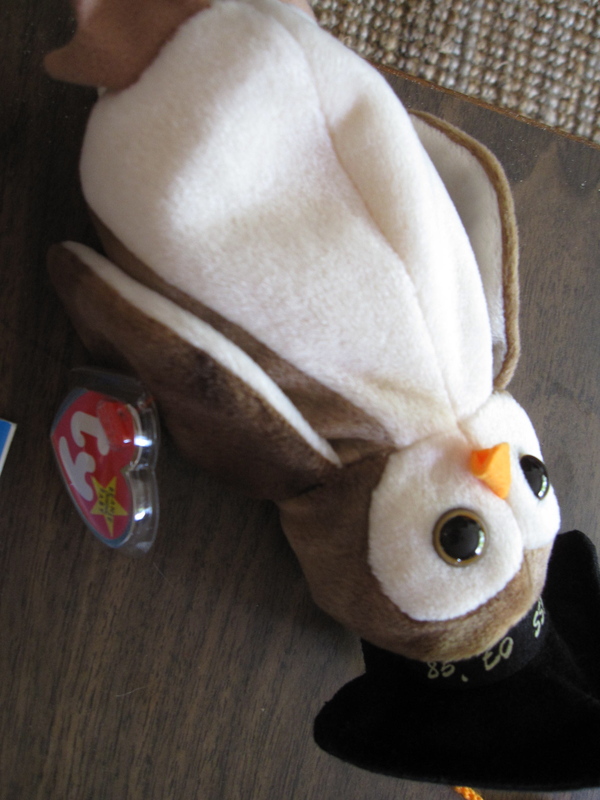 This entry was posted in childcare and tagged beanie babies on ebay, beanie baby owls, party favors for toddlers, three-year-old party favors on October 18, 2012 by thumbstumbler. 1) Put the stuffed animals in your drier with either a drier sheet, sachet of herbs or, if you don’t have those, a regular old towel. The tumble might get rid of some stink, and will also dust them off a bit. 2) Can you cut the hats off the owls? Or detach them with a seam ripper or exacto? Also, if you need to give Miles a graduation owl, he will still love it dearly. On the upside, Starboy LOVES his seal, and his orange. And the stickers! Home run gift bag.